According to medical experts, real human skulls aren't directly connected to the jaw bone. Yeah. I'm not pulling your thorax, pal. If you think I'm messing with your cranium, you should watch this 68 minute movie made in 1958. 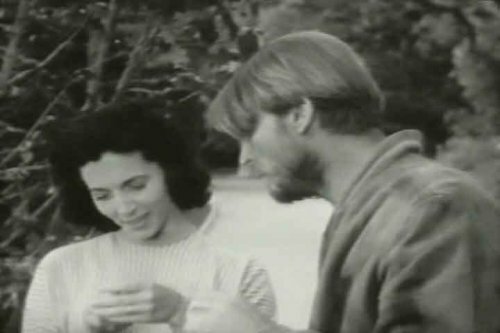 It was Directed by: Alex Nicol; and Starred: John Hudson, Peggy Webber, with Russ Conway. Why do I feel like this, Eric (John Hudson)? Why do I feel so on-edge ever since you and I moved into your ancestral home? Now please don't get me wrong. It's a lovely place. Honestly it is. Your garden is very well kept. Your house is very roomy and spacious. Plus your two old friends, Mister and Miss Snow (Russ Conway and Tony Johnson), have been kind enough to ask us out to dinner in a couple of day's time. However, when your gardener Mickey (Alex Nicol) told me that your dead wife could still be amongst the land of living, well, what can I say, my beloved husband? Things just haven't been the same for me again. One moment I can hear a thunderous knocking in the distance. The next moment I feel a gust of stale cold air blowing in the breeze. And on top of all that, there is the skull, Eric. That damnable skull I saw in the cupboard, in the flower-bed, and on the stair-well. Persistently hounding me as if I were a moth to a flame. But then again, that's most probably why what next transpires all goes rather baroque, when I say to myself, 'Jenni (Peggy Webber)! Am I going mad?'. As a childhood curse becomes taunting - Eric blames Mickey for the haunting - suddenly nothing is as it would appear - and during the cover of darkness, a scary skull digs in deep like a spear. Now when I normally sit down and watch a movie I'm about to review, I usually keep a few snacks by my side, just in case I feel like munching on something during these proceedings. But of course, me being a rather fastidious type of a chap, I don't eat everything I put in front me. Oh no. By in large I just have a bite here and there, especially when the film I'm watching is a particularly captivating one. Yet, having said all that, whilst I was watching 'The Screaming Skull', I demolished two chocolate bars and a jumbo sized packed of crisps, because for the life me, this old-school horror-classic kept me at the edge of my seat nigh on all the way through it. Yeah. I'm not talking out of my gullet here, pal. This is what I would call one rip roaring adventure I loved gawping at. As it managed to do a number of things on a number of different levels. Whilst on a narrative level this adventure is basically divisible by two. With the first half concentrating on Jenni's decent into hysteria, where as the second half acts as a 'who done it' type-tale. Chronicling what's been going on both before and after the first half actually happened. Also, I'd like to mention that even though none of the principal characters were very associative by nature -- despite Jenni have a great rack on her -- at the end of the day I still warmed up to them over the course of this movie. Honestly. It was a though the tale in itself made me care for them, in spite of me not really engaging with any of them because of they way they acted or came across on screen. Granted, to some extent Russ Conway's character did seem like the most caring one out of the bunch. But then again the rest of the main players did have a sort of warmish way about them too. Not much though. But some. Anyway. That's enough of that for the moment, folks. So please stand back, and prepare yourself for the following filmic-facts. (1) 'American International' first released this production in America on the very same month 'The European Economic Community' was first formed -- January, 1958. 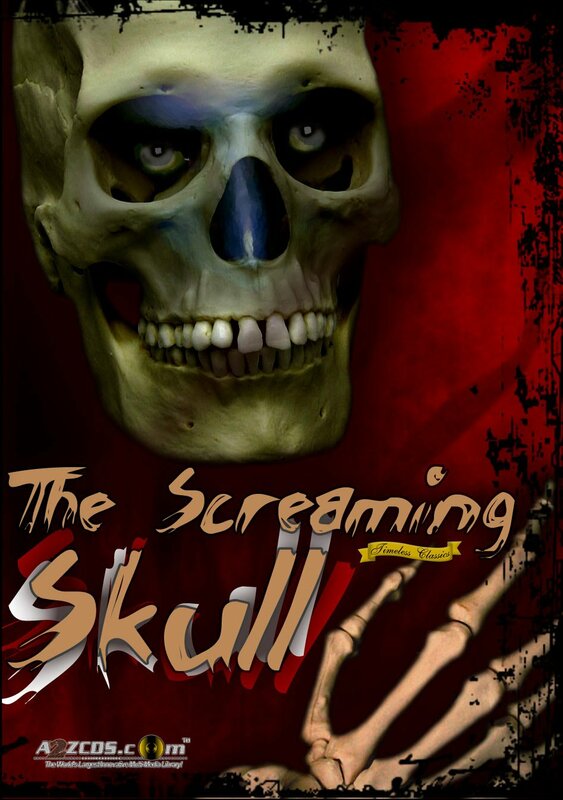 (2) Loosely translated, this project was entitled 'The Mystery of the Screaming Skull' in Germany, whereas all other countries stuck to its original name. (3) One of the taglines used to promote this picture, was 'FREE!! We guarantee to bury you without charge if you die of fright during SCREAMING SKULL!'. 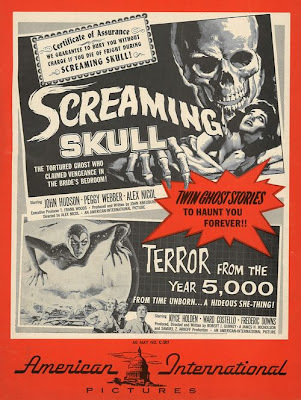 (4) When this movie was initially screened in the theaters, it was the top-half of a double-bill featured with Robert Gurney Junior's science-fiction thriller, 'Terror from the Year 5000'. (5) The death-mask you can see on Marian's tombstone was an actual reproduction of the famous "l'Inconnue de la Seine" suicide, where a young French lady killed herself by drowning in a pool of water. (6) Ernest Gold composed the music for this movie, and he would later go on to win an Academy Award for his amazing score on the 1960 historical-drama, 'Exodus'. (7) Even though she was never publicly credited for it, this flick was loosely based on a 1906 novel of the same name written by Francis Marion Crawford. Furthermore, it is suspected that Francis got the idea for her story from an old English tale, where the skull of a deceased black slave haunted his persecutors, by screeching within the box it was kept in. It is still kept in that box, and that box is on display in Bettiscombe Manor, Dorset. 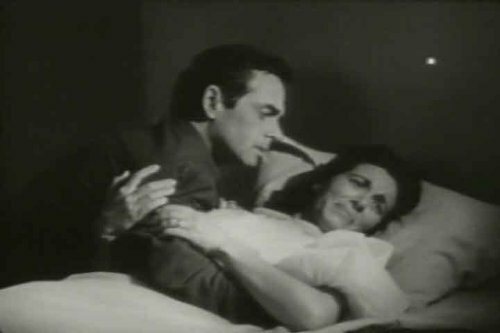 (8) After this horror film went bump in the night, John Hudson starred in the television series, 'Perry Mason'; Peggy Webber starred in another television series, 'Panic'; and Russ Conway starred in the romantic-drama, 'Flood Tide'. 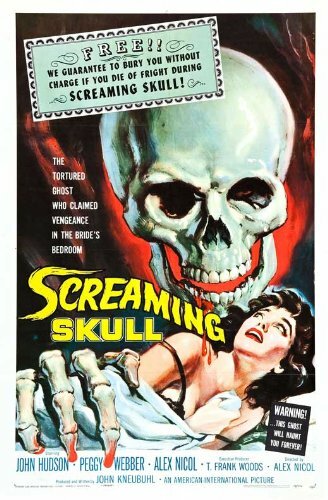 Overall I'd say 'The Screaming Skull' was a pretty decent movie for it's time. The story was an engaging one to follow. Most of the actors did a fairly good job on screen. And all in all, yeah, this flick had one hell of a punch to it. Particularly in the way it ended. Ha!